The bra you will want to wear every day. Seamless day bra is fabricated with Outlast&amp#174&amp#8212a material that absorbs your body heat, storing it when you~re hot and releasing it when you~re cold. Double-layer soft cups offer a modest appearance. Wireless construction. V-neckline. Wide band for a smooth fit. Adjustable back straps. Slip-on construction. A great sleep or leisure bra. Style #YT5-036. 34.2 percent Tencel&amp#174, 34.2 percent Outlast viscose, 25.6 percent polyamide, 6 percent elastane. Machine wash cold, tumble dry low. Imported. If you~re not fully satisfied with your purchase, you are welcome to return any unworn and unwashed items with tags intact and original packaging included. The bra you~ll want to wear every day. Seamless racerback bra is fabricated with Outlast&amp#174&amp#8212a material that absorbs your body heat, storing it when you~re hot and releasing it when you~re cold. Wireless cups are free of padding. Deep V-neckline crisscrosses at the plunge. Wide band for a smooth fit. Adjustable straps. Slips on over head. A great sleep or leisure bra. Style #YT5-038. 38.3 percent Tencel&amp#174, 38.3 percent Outlast viscose, 24.2 percent polyamide, 4.2 percent elastane. Machine wash cold, tumble dry low. Imported. If you~re not fully satisfied with your purchase, you are welcome to return any unworn and unwashed items with tags intact and original packaging included. A flattering cotton shaping legging that~s perfect for busy days, lazy afternoons, traveling, or the gym. Pull-on legging is fabricated from lightweight and comfy stretch cotton. Slims from the tummy to the ankles. Wide elastic waistband lays flat on the body. Style #YT2-179. 88 percent cotton, 12 percent elastane. Machine wash cold, line dry. Imported. Measurements: Outseam: 38 in Inseam: 27 1 2 in Front Rise: 10 in Back Rise: 13 in Leg Opening: 8 in Product measurements were taken using size SM, inseam 27.5. Please note that measurements may vary by size. If you~re not fully satisfied with your purchase, you are welcome to return any unworn and unwashed items with tags intact and original packaging included. A flattering cotton shaping legging that~s perfect for busy days, lazy afternoons, traveling, or the gym. Pull-on legging is fabricated from lightweight and comfy stretch cotton. Slims from the tummy to the calves. Capri length. Wide elastic waistband lays flat on the body. Style #YT2-220. 88 percent cotton, 12 percent elastane. Machine wash cold, tumble dry low. Imported. Measurements: Outseam: 26 in Inseam: 17 1 2 in Front Rise: 11 in Back Rise: 13 in Leg Opening: 12 in Product measurements were taken using size LG, inseam 17.5. Please note that measurements may vary by size. If you~re not fully satisfied with your purchase, you are welcome to return any unworn and unwashed items with tags intact and original packaging included. A pant for all your active endeavors in and out of the gym. Full-length legging is fabricated from an opaque stretch cotton knit. 360&amp#176 of control keeps you slim, smooth, and comfortable all day long. Wide waistband has a tummie-shaping panel. High rise. Comfortable flat-lock seams. Part of the Cotton Wow collection. Style #YA2-007. 86 percent cotton, 14 percent Lycra&amp#174 spandex. Machine wash cold, line dry. Imported. Measurements: Outseam: 38 in Inseam: 27 1 2 in Front Rise: 11 in Back Rise: 14 in Leg Opening: 8 in Product measurements were taken using size SM, inseam 27.5. Please note that measurements may vary by size. If you~re not fully satisfied with your purchase, you are welcome to return any unworn and unwashed items with tags intact and original packaging included. The bra you~ll want to wear every day. Seamless day bra is fabricated with Outlast&amp#174&amp#8212a material that absorbs your body heat, storing it when you~re hot and releasing it when you~re cold. Tank-style silhouette. Removable contour pads for shape and modesty. Wireless construction. Step in to put on or slip over head. A great sleep or leisure bra. Style #YT5-073. 46 percent Outlast viscose, 41 percent Tencel&amp#174, 10 percent polyamide, 3 percent elastane. Machine wash cold, tumble dry low. Imported. If you~re not fully satisfied with your purchase, you are welcome to return any unworn and unwashed items with tags intact and original packaging included. Take your jean leggings to another level. Features a regular rise and a skinny leg. Comfortably smooths tummy. Classic five-pocket construction. Belt loop waistband. Zipper fly and button closure. 65 percent rayon, 30 percent nylon, 5 percent elastane. Machine wash cold, hang dry. Imported. Measurements: Waist Measurement: 36 in Outseam: 42 in Inseam: 29 1 2 in Front Rise: 11 in Back Rise: 17 in Leg Opening: 12 in Product measurements were taken using size 1X, inseam 29.5. Please note that measurements may vary by size. 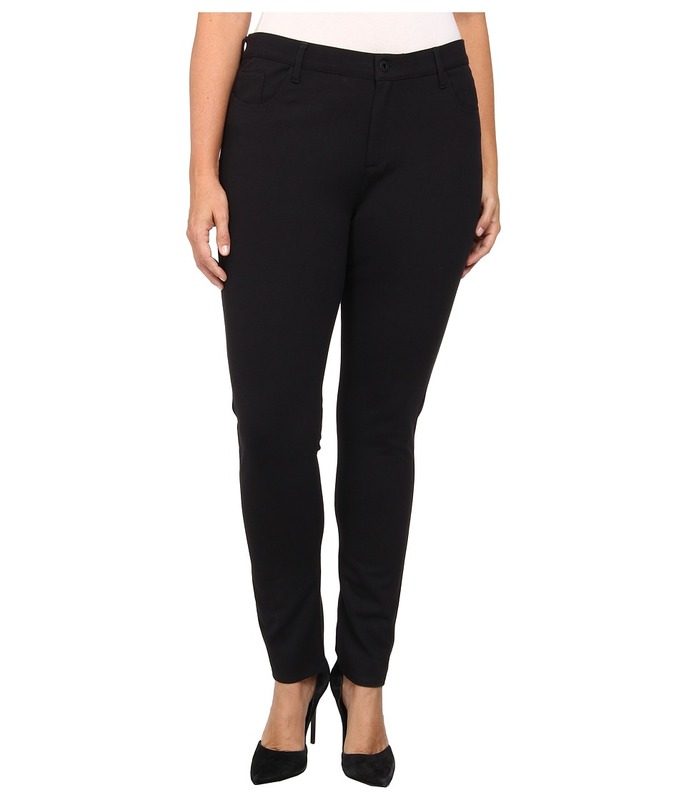 For the woman on the go, the Yummie by Heather Thomson Jodi pant can easily transition from afternoon yoga to evening errands. Higher rise and a sleek fit through the thigh that flares out at the knee. Curved waistband provides a more comfortable fit. 88 percent cotton, 12 percent elastane. Machine wash cold, hang dry. Imported. Measurements: Waist Measurement: 24 in Outseam: 40 in Inseam: 32 in Front Rise: 10 in Back Rise: 15 in Leg Opening: 16 in Product measurements were taken using size SM, inseam 31.5. Please note that measurements may vary by size. Create a sleek and polished look with this Yummie by Heather Thomson Yulia Skirt Slip. Sits higher on the waist to target your mid-section while smoothing out your hips and thighs. Raw edges creates comfortable, all-day wear. Silicone taping at the straight hemline keeps garment in place. Style #YT3-106. 73 percent polyamide, 27 percent elastane. Machine wash cold, line dry. Imported. If you~re not fully satisfied with your purchase, you are welcome to return any unworn and unwashed items with tags intact and original packaging included.